I need more space on my root partition running Ubuntu 17 (using Xfce session). I do have a lot of unallocated space BEFORE. If so, can it somehow be done from the live system or do I have to use live CD/USB? A partition can only be resized by modifying its end. Therefore first, you have to move the / partition to the beginning of the drive, gaining some free space after the moved / partition. Then you can grow the / partition which will be done by changing its end block number to a bigger number. 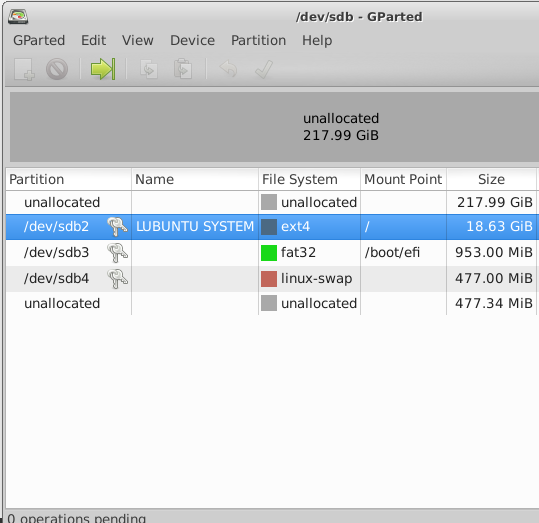 These actions can both be made through GParted, called from a live system on an USB or a DVD, but not from the current system where the partition is currently mounted. Not the answer you're looking for? Browse other questions tagged partitioning gparted ext4 unallocated or ask your own question. How to add unallocated space to root partition?